We are hard at work getting our new 2016 door hanger gallery online. Imprint area is - 2.75" x 6.375"
For a more economical alterative to full color printing, contact us for black & white pricing. 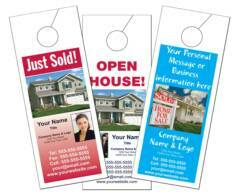 Door Hanger Size is: 8.5 x 3.25 (No Bleed) Imprintable area is: 2.75" x 6.375"
Add 5¢ for a 10pt cardstock per piece. on a heavy 16pt cardstock with 5 Sizes to Choose From! Great for higher volume orders 1000 min.